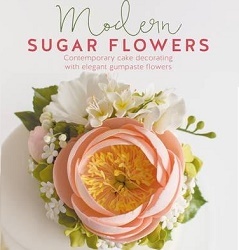 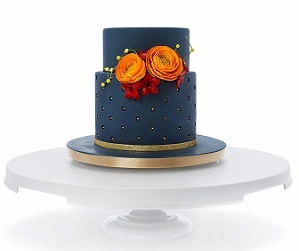 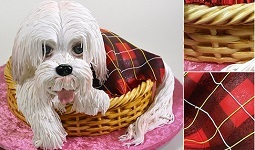 While vintage brooches have been on trend in cake design for some time, leading cake designers have been experimenting with a range of vintage pieces and jewellery designs in their latest heirloom-inspired cake collections. 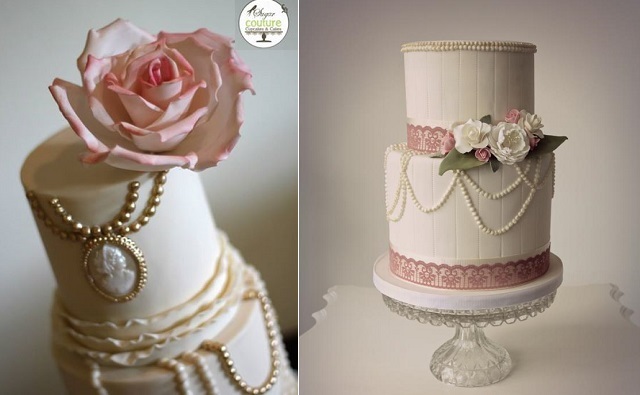 A super stylish lace applique wedding cake is dressed with with a chic pearl stack and heirloom brooch in the beautiful design above left by Edible Essence Cake Art, Plymouth and on the right, Baby Cakes, York have paired a vintage cameo brooch with a charming locket necklace in their exquisite design (image by Sarah Jane Ethan Photography via Rock My Wedding). 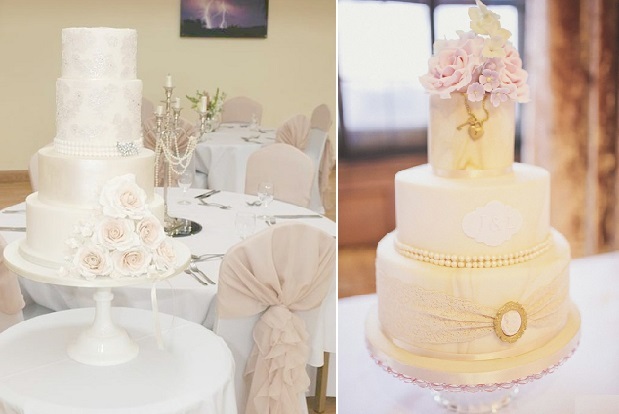 Sugar Couture Cupcakes & Cakes have designed the superb antique cameo and beads wedding cake (below left), with vintage pearls complemented with dusky pink lace in the design on the right by Consumed by Cake. 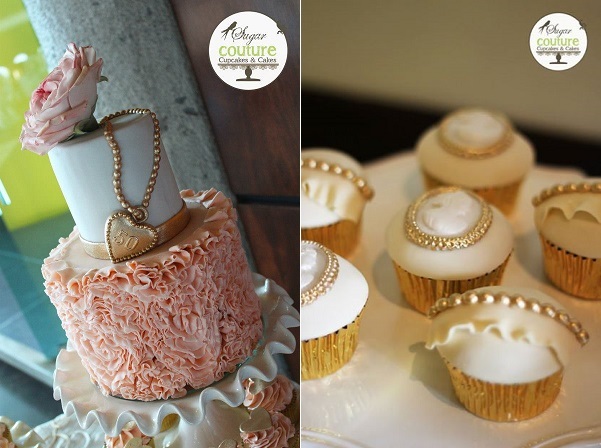 Vintage style lockets have become a trademark design of Sugar Couture Cupcaes & Cakes in their latest collection of wedding cakee and special occasion birthday cake with an elegant example in blush pink and antique gold below. 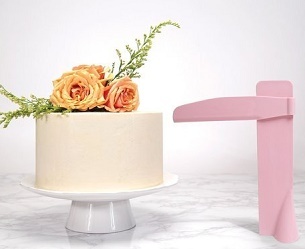 Pretty monogram charms add a unique element to the vintage collection of couture cupcakes below by La Cupella Cake Boutique. 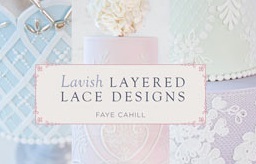 More charm cupcakes from La Cupella below. 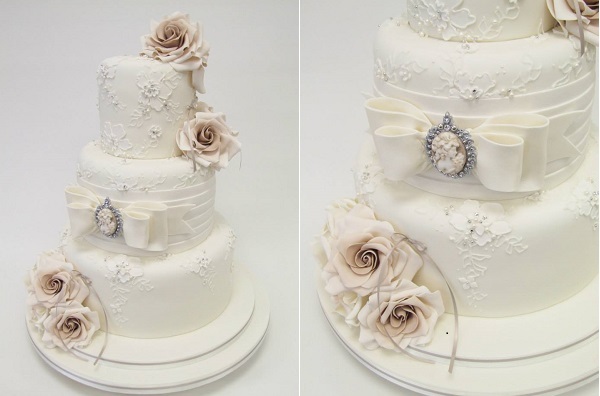 Emma Jayne Cake Design incorporates an heirloom sugar brooch in her exquisite lace wedding cake below for a beautiful old world finish. 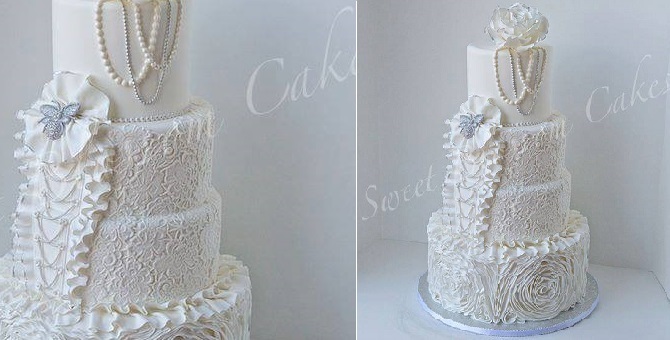 Strings of pearls add an elegant feminine touch to the beautiful pleated wedding cake design below by De La Rosa Cupcakes. 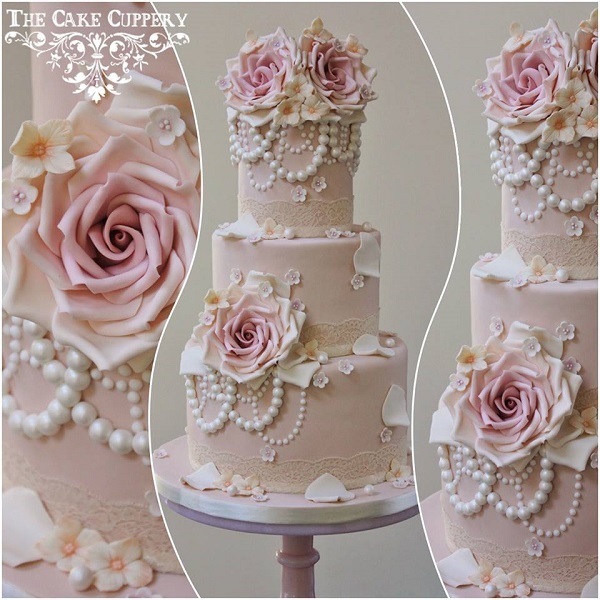 The Cake Cuppery, Dublin have used multi-sized pearls to create an opulent vintage wedding cake design below, dressed with over-sized vintage roses. 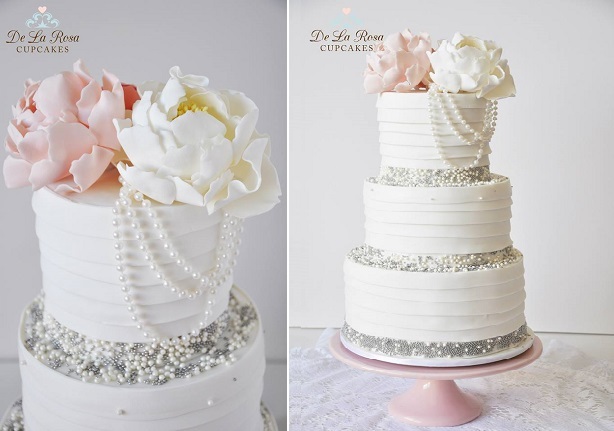 A sugarcrafted antique brooch and pearls add a wonderfully authentic touch to the pretty vintage jewellery wedding cake design below by Amelie’s Kitchen and on the right, jewelled centres add a luxe effect to the antique style wedding cake by The Bloom Cake Company, beautifully accessorised with vintage pearl garlands. 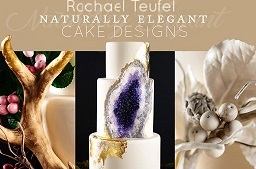 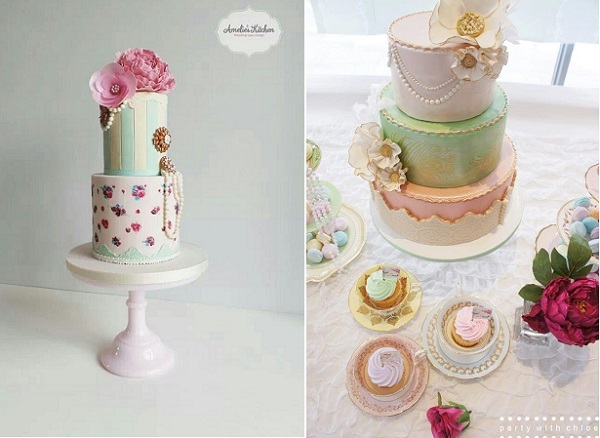 Layers and layers of pearl beads create a luxurious vintage effect in the two stunning cake designs below by Julie Moncrief’s Cakes (left) and Jenna Rae Cakes (right). 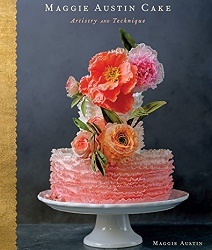 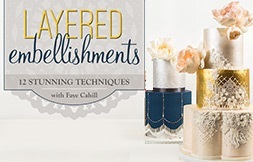 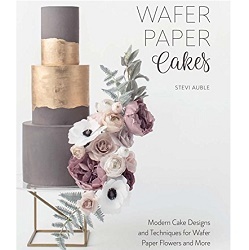 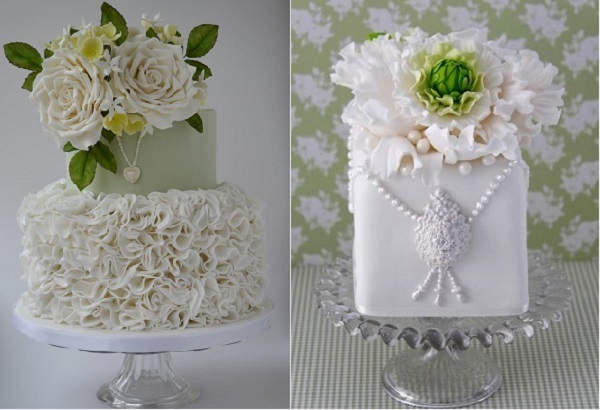 Layered ruffles create a subtle “faded elegance” effect in the antique wedding cake design (below left) from Sugar Couture Cupcakes and Cake, with more pearl luxe decor on the right (via Indulgy). 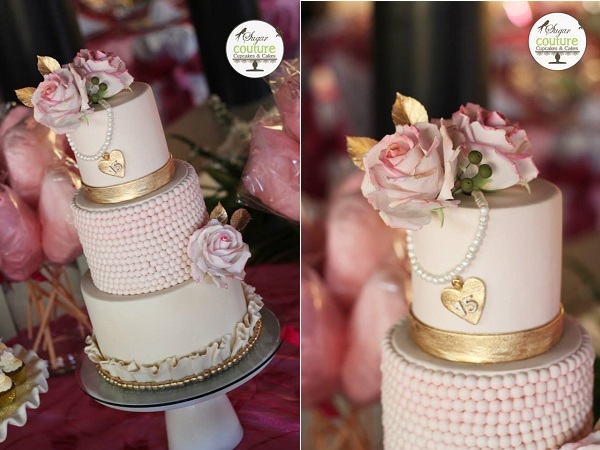 A gold vintage locket sets off the pretty peach ruffles in the elegant wedding cake design below by Sugar Couture Cupcakes and Cakes. 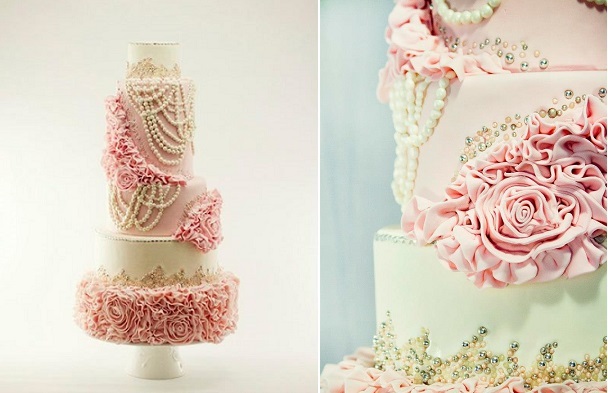 Heavy pearl ornamentation creates a wow design below in fabulous blush pink and ivory by Gat-O Quebec (image by Kelly Meagan Photography, via Cake Central). 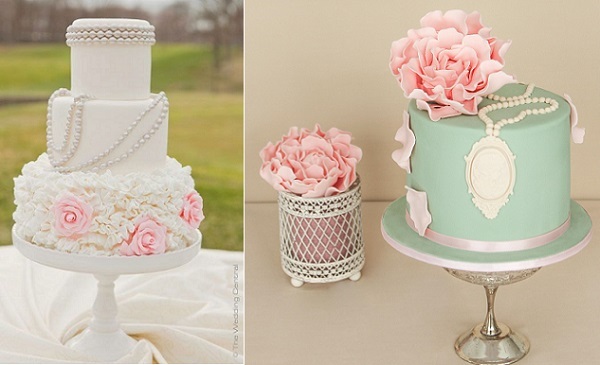 Three rows of pearls add an elegant classical trim to the top tier of the pretty ruffle cake below left by Sweet Grace Cake Designs and on the right, Pasteles Alma adds a fabulous vintage jewellery adornment to this antique green occasion cake. 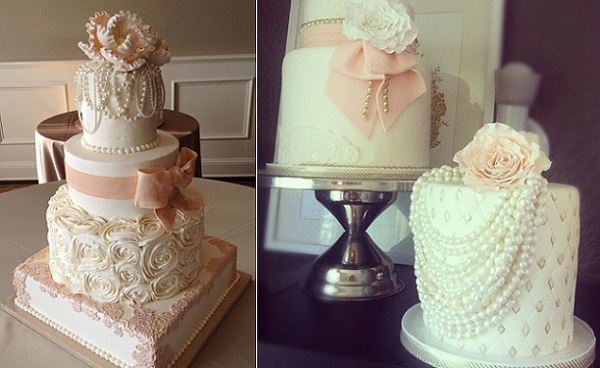 Vintage jewels grace the two elegant cakes below by Katie’s Cakebox (left) and Cakes Haute Couture, Spain (right). 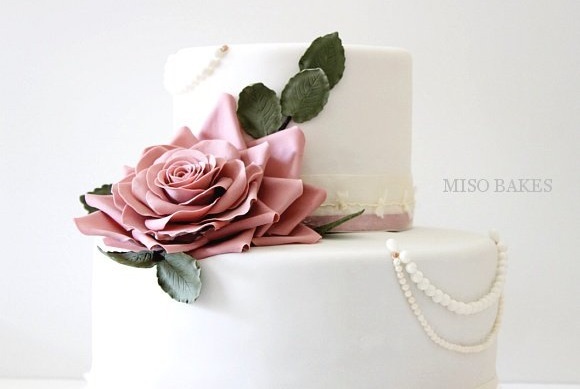 Beautifully placed pearl strands add a touch of chic to this graceful sugar rose cake by Miso Bakes. 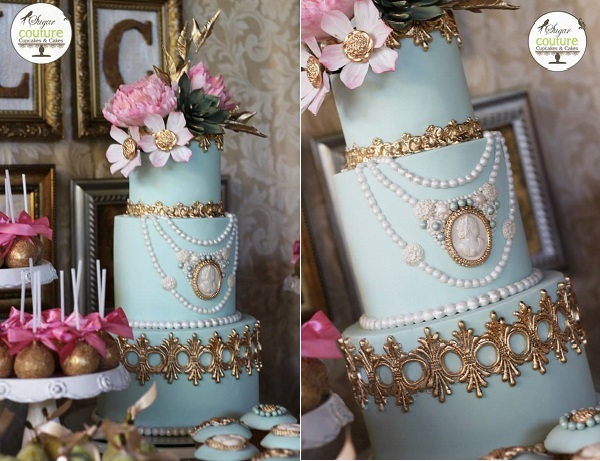 Gilded gold ornamentation and antique jewellery create an extravagant wedding cake masterpiece below by Sugar Couture Cupcakes and Cakes. 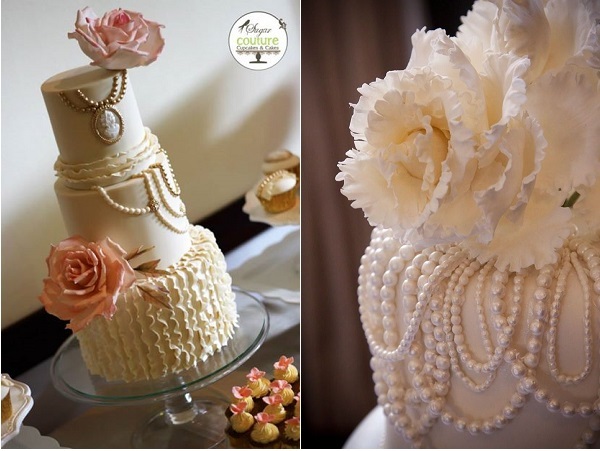 Wedding gown couture and vintage jewellery are combined to create a fabulously feminine statement wedding cake below by Sweet Dream Cakes. 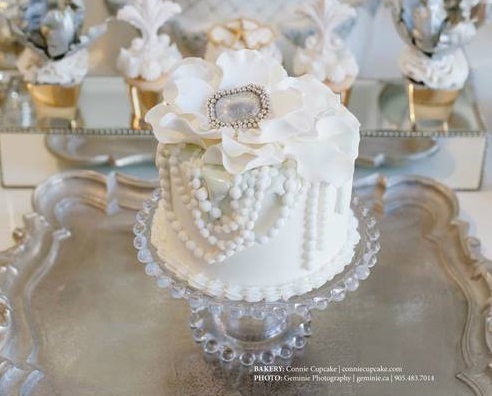 Silver pearls add luxe to the simple wedding cake design below by A Piece O Cake (image by Jenna MacKenzie Photography via Wedding Chicks). 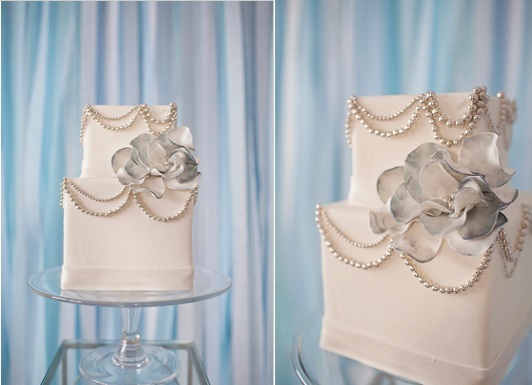 Oulent, lavish cakes are the trademark of Connie Cupcake Luxury Cakes with a perfect example below of a pearl draped creation topped with an exquisite sugar gem floral corsage (image by Geminie Photography). 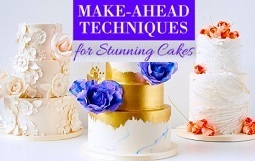 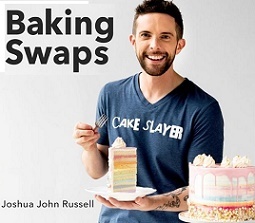 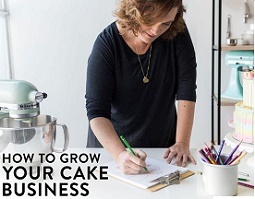 Black Iced Cakes (features some vintage jewellery cake designs also).